Overcast skies and windy. Slight chance of a rain shower. High 68F. Winds S at 20 to 30 mph..
Cloudy skies. Slight chance of a rain shower. Low around 60F. Winds S at 10 to 20 mph. 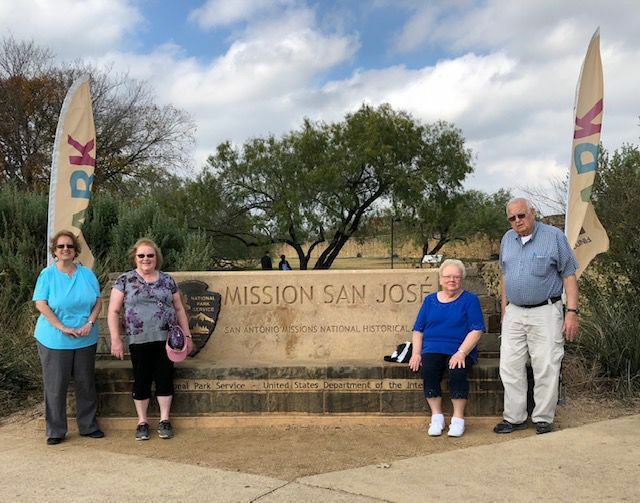 At Mission San Jose, from left, is Judy Snyder, Beverly Sayles, Sharon Coleman and Harry Snyder. Mission San Jose in San Antonio, Texas. I find that the more I travel, the more I appreciate the historical foundations of all parts of our country, how each place evolved in a particular era as compared to our local history of that era. It is amazing the perseverance and foresight of our forefathers and foremothers to preserve that history. Recent travels have taken me out west and down south. My sister and I visited friends Judy and Harry Snyder and their daughter, Sandy, and her family in San Antonio, Texas, last fall. Judy and Harry, formerly from Sterling, were very active members of the Sterling Historical Society, and Judy was the town of Sterling historian at one time. Our visit was filled almost every day with history and trips to all the five missions 1659-1795, San Antonio de Valero (the Alamo), 1718, the Paseo del Rio (the Riverwalk) boat ride (at night with the beautiful Christmas lights), Lyndon B. Johnson boyhood home and ranch 1950s near Johnson City/Stonewall, and even the “tiny” site of three or four buildings in Luckenbach, Texas (yes, Waylon, Willie and the boys). There are also five active military bases: Fort Sam Houston, where the Fifth U.S. Army is garrisoned, and Brooke Army Medical Center; Kelly Field Air Force maintenance installation; Brooks Field School of Aerospace Medicine, 1917; Randolph Air Force Base, "the West Point of the Air," 1930; and Lackland Air Force Base, 1942. All of these venues support the San Antonio economy. We sampled many varieties of Mexican food, went to a mega church one Sunday, and even attended a Celtic Thunder concert at the beautiful Majestic Theatre, 1929 Spanish style, renovated in 1989 in San Antonio and now a national historic landmark. 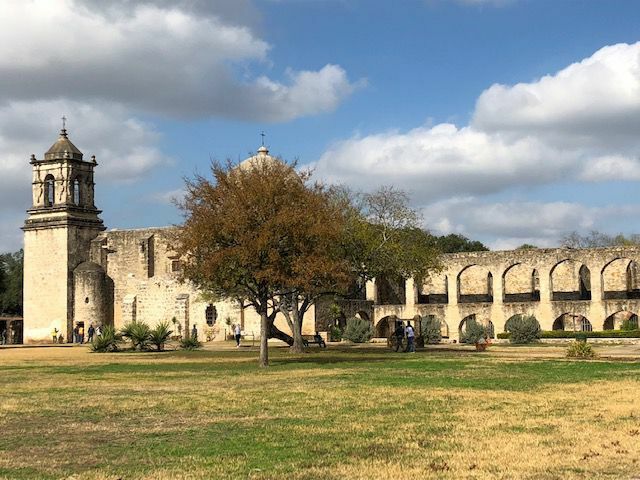 As historians, we constantly think “preservation” of our town history and sites, and it was fantastic to see Texas history preserved from the 1600s along with renovation/remodeling of new tourist attractions and museums. It takes a lot of money, time and commitment to protect, promote, support and preserve with purpose and vision to maintain that unbroken connection to the past. It is also a great economic boost to all of us in the “history business” when stores/markets/farms/homes that unfortunately close can be repurposed into educational centers, tourist attractions, parks/trails or an historic place to display artifacts and the legacy of generations. When New York state was busy building the Erie Canal, steamers were on the lakes of Lake County, Florida. The homesteaders of 1850-1875 Eustis, Mount Dora, Tavares and Leesburg area benefited from receiving goods and services in this way before the telegraph came in 1878 and the railroads came in 1880. Not unlike Joe Raiti’s general store in Victory, the Clifford Store on Lake Eustis sold groceries, stoves, crockery, hardware, building materials, hay and grain. Churches encouraged the formation of schools and seminaries. Many of our small towns in Cayuga County had different names throughout history. Weedsport was once known as Weed’s Port, Weed’s Basin and Macedonia. Eustis was known as Highlands and Pendryville, and finally named in 1825 after Gen. Abraham Eustis, who served in the Seminole Wars and had fought with Indians on the south shore of Lake Eustis near Tavares. In Mount Dora, the first orange groves were established in 1873 by “Doc” Henry, and in Eustis, homesteader A.S. Pendry planted many citrus groves. In 1902, Pendry put an addition onto his splendid hotel. To honor this, the residents of Eustis planned to honor him with a big celebration they called the George Washington Birthday Celebration. It is the most popular and longest-running event honoring Washington’s birth in all of Florida, and second in the United States. This special annual event in Eustis was held on Feb. 22-24 for the 117th year, and is now called “Georgefest.” It featured a carnival, choirs, lots of bands and live music, plus a concert by Plain White T’s, food, vendors, a 5K run, a dog jog, fireworks, seaplane rides, magic shows and a parade, and was thought to draw some 30,000 people. Most venues were free and sponsored by the chamber of commerce, the city of Eustis police and fire departments, and many other businesses in surrounding towns. The city also holds First Friday celebrations, as we do here in Auburn. • 200th anniversary of the Erie Canal continues; and the Port Byron Old Erie Canal Heritage Park opens in May. Beverly Coleman Sayles is the Victory town historian and a New York state registered historian, and can be reached at (315) 730-3183 or beverlycs65@gmail.com.